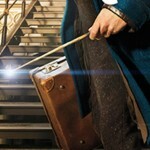 THE HARRY POTTER SHOP AT PLATFORM 9 Â¾ will officially open its doors to the public on Saturday, 15th December 2012 at 7:30 am. Situated near the platform 9 Â¾ trolley at London’s newly refurbished King’s Cross Station, the shop will sell items such as golden platform 9 Â¾ collectible train tickets, wands, robes, uniforms and other collectibles in homage to the successful Harry Potter film franchise and book series. 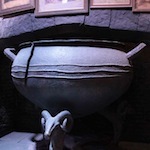 THE HARRY POTTER SHOP AT PLATFORM 9 Â¾ has been produced by Jonathan Sands (Founder and Chief Executive of London Film Museum) and partners, under license from Warner Bros. Consumer Products. 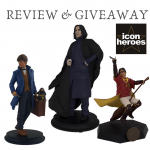 REVIEW: Icon Heroes Severus Snape Statue--and Giveaway for a Lucky Leaky Fan!